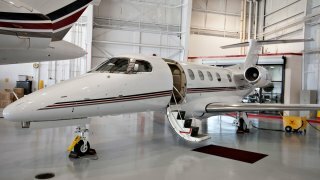 Some bin Laden family members were killed in England when a Embraer Phenom 300, similar to the one seen here in Nebraska in May 2013, crashed while trying to land at a private airfield on Friday, July 31, 2015, a Saudi official said. Family members of the late al-Qaida leader Osama bin Laden were killed in a private jet crash in southern England, a Saudi ambassador said, without identifying the dead. Prince Mohammed Bin Nawaf Bin Abdel-Aziz, the Saudi ambassador to the United Kingdom, offered his condolences to the wealthy bin Laden family, who own a major construction company in Saudi Arabia. "The embassy will follow up on the incident and its circumstances with the concerned British authorities and work on speeding up the handover of the bodies of the victims to the kingdom for prayer and burial," the ambassador said in a statement tweeted by the embassy late Friday. The plane crash happened Friday, when an Embraer Phenom 300 jet tried to land at Blackbushe Airport, an airfield used by private planes and flying clubs some 40 miles (65 kilometers) southwest of London. British authorities said four people were killed in the crash, which saw the plane smash into a car auction center. The official Saudi Press Agency earlier identified the plane as Saudi-owned without mentioning the bin Ladens. It said a Saudi official would work with British authorities in investigating the crash. The bin Laden family as a whole disowned Osama in 1994 when Saudi Arabia stripped him of his citizenship because of his militant activities. The family is a large and wealthy one. Osama bin Laden's billionaire father Mohammed, who died in 1967, had more than 50 children and founded the Binladen Group, a sprawling construction conglomerate awarded many major building contracts in the Sunni kingdom.